At the occasion of the Minister Julie Bishop´s state visit to Germany, the Australian Embassy in Berlin hosted an evening reception on 6 September which was attended by several GABC members. 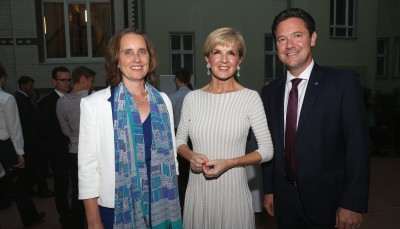 The Minister led an Australian Government delegation to attend the first German-Australian “2+2” consultations. This new format brings together the two country´s respective Ministers for Foreign Affairs and Defence and was attended by Minister Julie Bishop, the Australian Minister for Defence, The Hon Marise Payne, and their German counterparts Federal Minister Frank-Walter Steinmeier and Federal Minister Ursula von der Leyen. In her speech to the evening reception´s guests, Minister Julie Bishop also announced the program of the 2017 Australia now initiative. This year-long series of predominantly cultural events seeks to highlight Australia´s creativity and power of innovation. Dubbed a “celebration of Australia´s culture in Germany”, the program will raise Australia´s profile in Germany and highlight the country´s cultural richness and diversity. 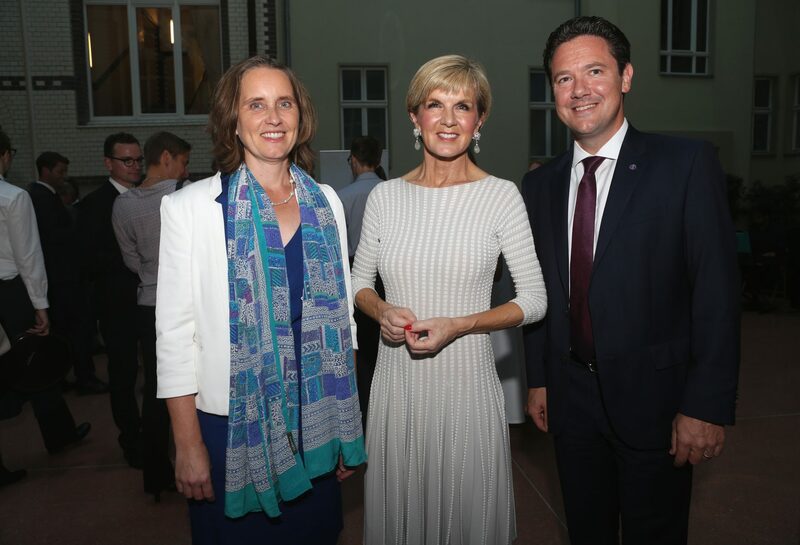 Julie Bishop, Foreign Minister of Australia, with Board members of the German Australian Business Council, Sabine Pittrof and Evangelos Kotsopoulos.